Get ready for Big Little Lies. The limited series debuts on HBO on February 19th, and between its twisty-turny plot—murder! secrets! PTA meetings!—and its all-star cast, there's virtually no doubt that Big Little Lies will be all the chat round the water cooler. (Real-life or virtual.) Reese Witherspoon is one of those all-stars—and as well as acting in the series alongside Nicole Kidman and Shailene Woodley, she's one of its executive producers, too. Episode two of Big Little Lies will be going head-to-head with this year's Academy Awards broadcast on February 26th—which made us recall just how absolutely amazing Reese looked at the Oscars ceremony in 2002. How amazing? TIME magazine put her Valentino-made look in its "Top 10 Everything" rundown for 2002. As Richard Lacayo and Belinda Luscombe wrote, "when dressing up is what an event is all about then it's key to have as sublime a vision as Reese Witherspoon in her black lace Valentino gown." "Gown" may not have been quite the right word—the dress, from the Valentino Fall/Winter 2002/2003 Haute Couture collection, boasted an air of un-gownlike insouciance, courtesy of its cap-sleeves, fitted shape, tee-shirt neckline of sheer chiffon, and abbreviated ankle length. 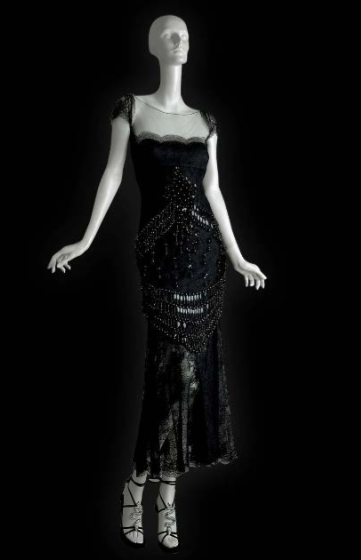 The frock's formality, meanwhile, came from its Deco-esque pattern embroidered in jet, sequins, glass beads and lace. Together, the tones of youthful and sophistication fused perfectly—and perfectly synced with the person Reese Witherspoon was, in 2002. As Mr. Valentino recalled to InStyle, back then Witherspoon was a newly minted star, and the 2002 ceremony marked her Oscar debut. "Reese wasn't as established back then," Mr. Valentino noted. "People thought of her as cute, but not glamorous." Thanks to her Valentino makeover, no one questioned Reese Witherspoon's glamour cred ever again.